The evidence is in: when young people don’t spend time outdoors in unstructured play, it is bad for them and bad for society. Conversely, the more time they spend outside the better it is for them and for society. In case you believe this isn’t a very pressing issue, think again. Outdoor play among American children has declined by 50% over the last two decades, and the results have been disastrous. Lack of physical activity in children has led to skyrocketing obesity and obesity-related diseases including Type 2 diabetes, high blood pressure, asthma, liver disease, vitamin D deficiency, osteoporosis, stress, depression, and attention deficit disorder. Startlingly, the lifespan of many of today’s youth may be shorter than that of their parents. One main reason is that we are vastly more “plugged in” as a culture today compared with only a generation. According to the Kaiser Family Foundation, children spend an average of six and half hours per day using television, computers, DVD players, and mp3 players. Eight to ten-year olds spend an average of four hours a day watching TV. This translates to well over forty hours a week, or the equivalent of a full-time job. This disturbing trend even caught the attention of Congressman Jimmy Duncan, when he discussed technology addiction in his August 2012 Legislative Update. There are real world consequences to this for you and me. Costs related to childhood obesity before long could reach $100 billion annually. Economy-watchers should be concerned for other reasons as well. Fewer people spending time outdoors means fewer dollars feeding outdoor retail sales, a $730 billion a year industry. Spending less time with electronic devices is only part of the answer. The key is to get outside in nature and engage in more unstructured playtime. Doing this may require a certain amount of “letting go” on the part of parents. It will mean coming to grips with potential risks such as stranger danger, traffic, liability, bites and stings. All too often parents use these as an excuse to keep their children indoors where it is “safe.” But in the long run, the greater risk is not allowing kids to explore the outdoors. 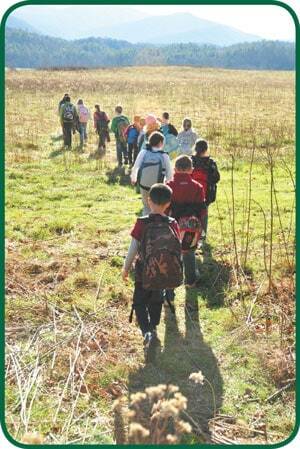 Study after study has shown the benefits to children from contact with the outdoors and nature. Kids are better able to concentrate in school, attain better grades, maintain normal weight, and sleep better. Further benefits include healthy brains which leads to emotional, cognitive and social development. The risks for obesity, depression, attentional and anxiety disorders decrease sharply. “Time in nature is not leisure time; it’s an essential investment in our children’s health,” writes Richard Louv, author of Last Child in the Woods. It’s of course also an investment in the future of our country and natural resources. A healthy nation depends on healthy individuals after all. So go outside and take a child with you. Go for a walk in the woods. Plant a garden. Count squirrels. Fish, hunt and mess around in the dirt. Encourage your local school to create and utilize outdoor teaching spaces. Sponsor a child at summer camp. The ideas are endless. Do one or more of these things and you’ll be doing a future generation of Americans a huge favor. Jeremy Lloyd has taught environmental literacy at Great Smoky Mountains Institute at Tremont since 1996. He is the author of A Home in Walker Valley: The Story of Tremont as well as Great Smoky Mountains Pocket Guide and Journal.